Last Monday the world found out for the first time via an Associated Press article that Dr. He Jiankui, from the Southern University of Science and Technology of China in Shenzhen, claimed to have made the world's first genetically edited twins (intended to be resistant to HIV infection). Last week Dr. He spoke at the Second International Summit on Human Genome Editing in Hong Kong; his actions have been condemned by many and defended by a few. In any case, if the independent review of the unpublished results is found to be accurate, then we stand on the precipice of a significant milestone in human history. To provide a forum to discuss Dr. 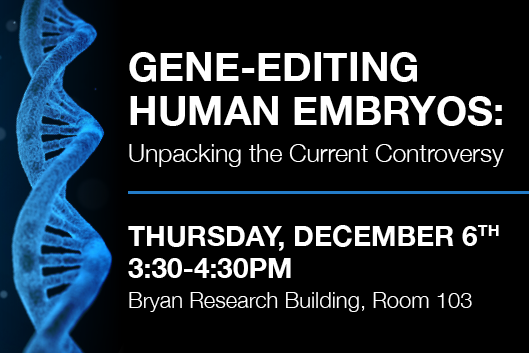 He's research, the UPGG and MGM programs have convened a special symposium on Thursday 12/6 from 3:30-4:30 in 103 Bryan Research. We will hear from Dr. Charlie Gersbach who attended the Human Genome Editing summit in Hong Kong and has very generously agreed to describe the research, the meeting's response, and his thoughts on the science. It will be moderated by Simon Gregory.